I am such a sucker for grill marks. There is something about them that makes my artist’s eye really happy and quivery. I have been seeing grilled or fried cheese just about everywhere and really wanted to try my hand at it. Halloumi cheese seems to be the one most frequently chosen for grilling because of its low fat content, around 25%, and high melting point. Halloumi originated in Cypress, which is a Greek and Turkish island country in the eastern Mediterranean Sea, south of Turkey and west of Syria and Lebanon. It was initially made there during the Medieval Byzantine period and traditionally contains sheep and goat’s milk. 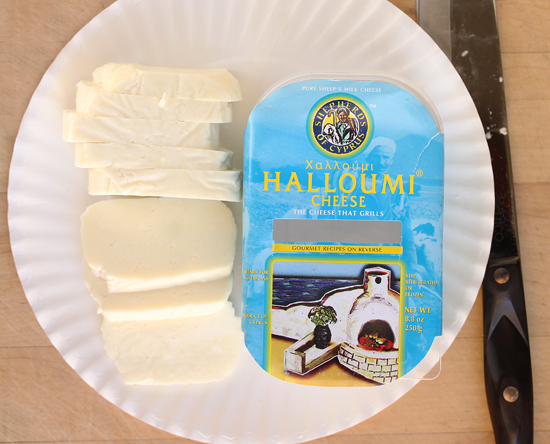 The Halloumi I used was made from only sheep’s milk and it had that really salty sheep-y taste I love. The texture was firm, even a little rubbery and the flavor of the grilled brown parts was so tasty. Because Halloumi doesn’t melt, it is perfect for adding cubes to skewers with meats or vegetables for grilling. You can slice or coarsely grate it over pasta or pizza, or into salads, soups and omelettes. Use it on a sandwich like you would ricotta insalata. If you like the saltiness of feta, you will love Halloumi. I will definitely be finding other recipes in which to use this cheese. Yum. The edible flowers in this salad all came from my garden. It was so much fun to pick them and place them just so on the salad. The little blue one at the top is from my borage plants. The larger orange ones on left and right are nasturtiums and on the bottom white carnation. The little one in the middle is a basil flower sprig. I had some marigolds earlier in the summer that I was going to use, but they are done now. Actually there are many edible flowers and you can probably find them in your garden. For a complete list of edible flowers you can click here, and be sure to read about the do’s and don’ts before going off with your basket and scissor. I put my flowers in a bowl of water and refrigerated them until I put them on the plate. 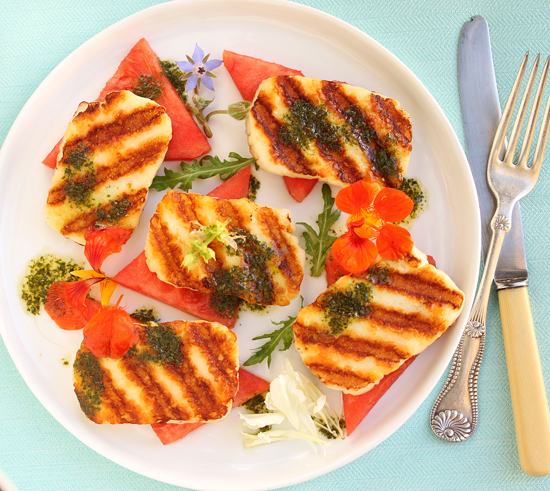 Halloumi with watermelon is a traditional Cyprian dish, and with good reason. The salty tangy cheese and sweet watermelon with the herby basil-mint sauce are such a taste treat. Not only is the flavor beguiling, but the texture of the crunchy melon and chewy cheese is really interesting, along with the minty aroma of the sauce. This salad has it all and I hope you give it a try. Bon Appetit. 1. Place sauce ingredients in blender or mini food processor and whiz until sauce consistency. Place in small bowl and chill, covered. 3. Heat grill pan, or charcoal or gas grill, to high. Do not oil grill pan. Place cheese slices diagonally across the grill ridges and cook until grill marks appear on presentation side and are just starting to melt. Do not move them until ready to turn. Use tongs to gently lift one edge only enough to see status. Turn and grill second side briefly. 4. Place watermelon slices on serving tray or two slices on each of four plates. Top each with a slice of Halloumi. Sprinkle edible flowers around cheese and drizzle sauce over all. Sprinkle with sliced mint and arugula, if using. Pass extra sauce at table. Note: If you do not have edible flowers, grilled cherry tomatoes or grilled plum or red pepper slices could be used. Wow, this is a beauty and I learned so much! I buy feta all the time but have never bought Halloumi. And I didn’t know white carnations were edible. That must be what they use to make Carnation milk. I love to taste test this cheese as it is not melting version, I can use it even in curries. This salad looks perfect and delicious. Halloumi-mi-lujah! that looks incredible! Great information on edible flowers. Oh my goodness gracious, do I want to eat this right now. 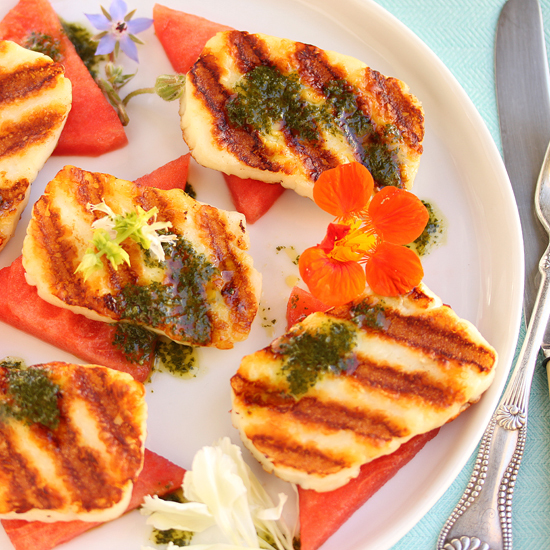 Halloumi is one of my favorite cheeses but I never thought to pair it with watermelon. Thanks for the great idea! Lynne, I LOVE grilled Halloumi!!!!!! Your picture is beautiful!! !